NTU continue to work with Nottinghamshire Wildlife Trust as Wildlife Guardians. On Wednesday 11th April, members of Nottingham Trent University's Estates department received certification of the University's renewed Wildlife Guardian membership, reflecting the University's ongoing relationship with Nottinghamshire Wildlife Trust. This relationship goes back more than twenty years. Students frequently volunteer or undertake placements at the Trust or its in-house ecology company Emec. Several NTU Alumni have worked for the Trust and valuable research has been carried out by students and academics within this partnership. Over the past ten years, the Trust and the University have collaborated on the peregrine falcon project. A pair of falcons nest on NTU's Newton & Arkwright building where there is a nest box and cameras to provide security. Maintenance is carried out by NTU staff and Nottinghamshire Wildlife Trust offer their expert advice on the birds' health and behaviour, as well as supervising the ringing of the chicks before they fledge. 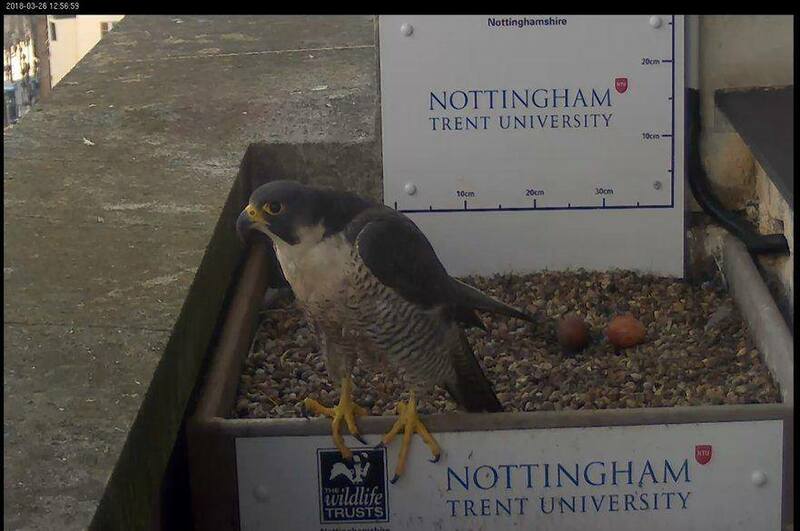 The cameras are watched live by the general public on the NTU website and provide fascinating insights into the lives of the falcon family. As Wildlife Guardians, NTU is supporting the Trust to manage their 67 nature reserves and provide wildlife conservation advice and education to the public and landowners. 50% off individual membership to Nottinghamshire Wildlife Trust for one year! Contact Membership Officer Kirsty Wardle on 0115 958 8242 or email. Find out more on the Trust's website. 20% off Wild Away Days team building sessions. Contact Holly McCain on 0115 958 8242 or email for details. 20% off conference room bookings and catering at Attenborough Nature Centre (near Beeston) and Idle Valley Visitor Centre (near Retford). Click here for current rates and room hire options. For more information on the work carried out by Nottinghamshire Wildlife Trust, visit their website.